When looking back at the Star Wars saga, especially the original trilogy in particular, it's very easy to wonder where all the female characters are. Beyond Princess Leia herself, it doesn't seem like there's enough representation in the Star Wars galaxy. Never fear! This wonderful book by Amy Ratcliffe provides a wealth of information about all the female characters that have appeared over the years. Not only in the movies, but in the books and comics and TV shows too! Each chapter details another character, introducing the reader to who these fierce women are, where they came from, and why they're important! The book is also filled with beautiful artwork from many talented artists. I cannot recommend it enough! The women of the Star Wars galaxy drive its stories and saga forward at every level. This beautifully illustrated, fully authorized book profiles 75 fascinating Star Wars women from across films, fiction, comics, animation, and games. Each character is explored through key story beats, fresh insights, and behind-the-scenes details by author Amy Ratcliffe. Also showcasing more than 100 all-new illustrations by a dynamic range of female and non-binary artists, here is an inspiring celebration of the Star Wars characters that help create a galaxy far, far away. Amy Ratcliffe is the managing editor of Nerdist, a contributor to StarWars.com, and has written for outlets such as Star Wars Insider and IGN. She's a host at Star Wars Celebration and cohosts the Lattes with Leia podcast. © & TM LUCASFILM LTD. Used Under Authorization. Amy Ratcliffe writes about entertainment, travel, television, and Star Wars for outlets such as Nerdist, IGN, Star Wars Insider, and StarWars.com, and cohosts the Full of Sith and Lattes with Leia podcasts. She lives in Los Angeles.
" Women Of The Galaxy by Amy Ratcliffe is a timely and welcome book celebrating the female characters who have entertained and enthralled us throughout the 'Star Wars' saga. It provides an in-depth look, both in story terms and behind-the-scenes, of the women who have stood up to the Dark Side or in some cases, fully embraced it." 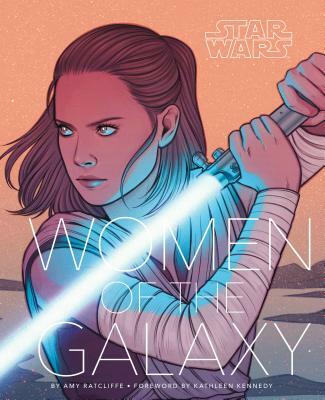 "Star Wars: Women of the Galaxy is wonderfully illustrated, with 100 all new illustrations by a range of female and non-binary artists. . . . Too often the story of Star Wars is presented as driven by male characters but Star Wars: Women of the Galaxy demonstrates the strong and inspiring female characters that helped tell the story and shape the Star Wars universe." "Star Wars: Women of the Galaxy is beautifully designed. From the stunning Rey and Leia front and back cover art done by Jen Bartel to the page layouts and the use of character names in Aurabesh as a dividing line, the book looks monumental and modern at the same time." "10 out of 10 stars"
"A beautiful anthology...that will inspire you again and again with stories of courage, daring, and love from the women whose stories influenced your childhood and those who continue to do so through new additions to the canon. Star Wars fans will love this book and it will especially resonate with women and girls looking to find their own place in the galaxy." Holiday Gift Guide Pick "What makes this a truly great gift, though, is the character analysis included for each person. Backgrounds, catch phrases, motivations, mistakes, and victories are painted in prose alongside beautiful illustrations of each character. The tome brings the characters to life in a visceral way. Whether you're trying to inspire greatness in a young one, or foster understanding of the greater universe, Star Wars: Women of the Galaxy is the perfect gift for most any age." "this is not only good for the Star Wars fan who knows everything about this universe, but for the more casual fan looking to get into the world or even for a future Star Wars fan you are cunningly trying to convert so you can nerd out about Star Wars together. You're welcome." "[Star Wars: Women of the Galaxy] contains profiles of 75 canonical female characters, fully illustrated in a striking array of styles (a postcard set's also available). The text deftly weaves in-universe and out; obscure pastel droid R2-KT will remain in your memory banks much longer after reading her heart-rending off-screen backstory." "This beautiful hard-cover book celebrates 75 female characters - yes 75! - drawn from Star Wars plethora of films and TV shows plus comics, novels and video games. Within the pages of Star Wars: Women of the Galaxy, you'll find 110 all-new pieces of art that any Star Wars feminist would be proud to own." "The result is something that is at once informative about characters both iconic - Leia and Rey get multiple pages of attention - and obscure (Prepare to meet R2-KT and learn all about the singer of Jabba's house band from Return of the Jedi), and a reminder of the depth of the cast list of the Star Wars franchise." "The brilliant part of Women of the Galaxy is the mix of female characters that are discussed. From our beloved hero characters to the downright shady, the book has every type covered. The Padmé, Leia, Rey and Ahsoka Tano sections of the book will bring huge smiles to all Star Wars fans. The job Amy Ratcliffe does in telling the background stories of the well-known characters is truly incredible." "Ratcliffe adds fascinating behind the scenes perspectives throughout Women of the Galaxy." "My favorite parts of the book involve getting to dig in to some of the more obscure characters that the casual fan may not be aware of, characters like Rae Sloane, Kyrsta Agate, or Ciena Ree from the novels and Doctor Aphra, Sana Starros, or Queen Trios from the comics. There's even a whole page dedicated to Mama the Hutt (Jabba's grandmother) from the Clone Wars series which I found to be both refreshing and hilarious at the same time." "It's a handsome, beautifully designed book that will stand out on bookshelves. As a first dip into the female characters of the galaxy it's a must, and as the first book written and drawn entirely by female creators it deserves every ounce of credit and plaudits it gets." "Carrie Fisher liked to joke that Princess Leia was the only woman in the galaxy-but that's no longer true. From the heroines of The Force Awakens and Rogue One to characters from TV, comics and novels, this lovingly illustrated book explores the feminine (and, increasingly, feminist) side of the Star Wars universe."